“Baby, come look! What is that on the lawn?” It wasn’t a plane or a UFO and it wasn’t Superman. It was a big brown bird, for sure, standing out in the middle of our spring grass. We both thought it looked enough like a wild turkey, were we not in a city of three-quarter million, it might be a turkey. Surely it must be a big, ol’ vulture. As we watched through the window, the bird walked closer. 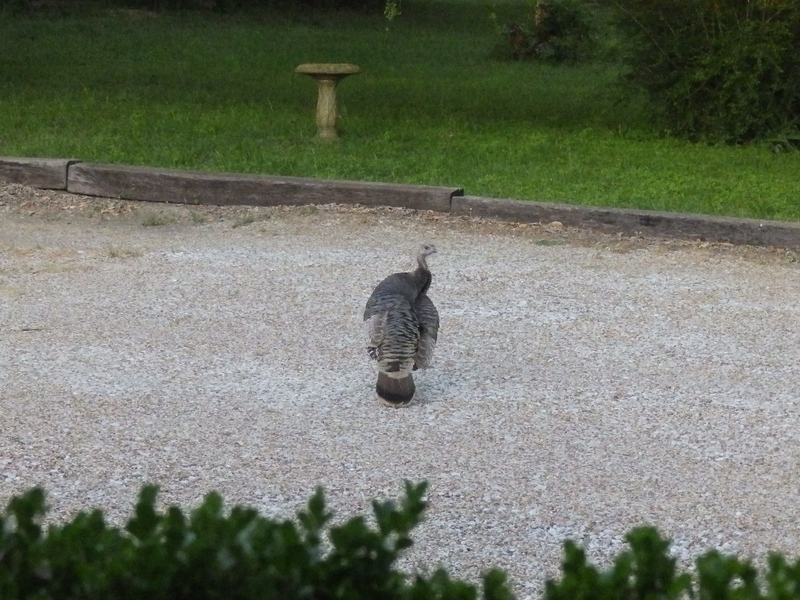 It was a wild turkey hen! It crossed the driveway and turned its eye toward us. I thought it was going to come right up the steps and ask for a drink. My husband popped four batteries in the camera and brought it to me, since I was the one all agog, chasing the poor girl around the lawn, calling “Duck-DUCK!” in an inane attempt to reassure her. After I took my pictures and left the wild thing alone to nibble on the grass and get her bearings, I settled in to think about our interaction. I was amazed; she was leery. I talked; she obviously misunderstood. I pursued; she kept her distance. I had a gazillion questions about how she landed in my lawn; she had questions she could not ask about how to survive in the city. I assumed my right to be here; she knew she was trespassing. I was bold; she was shy but incredibly brave. This put me in mind of a conversation I once had at a Laundromat. A Mexican lady asked me something in Spanish. I knew “si” and she knew “yes.” “Machine” and “maquina” sounded similar. I figured out “lavar” meant wash when she rubbed her hands in a scrubbing motion and twisted her hips like an agitator. She had put her dinero in the maquina, it did not laver and I think she wanted to know how to get a refund. I pointed to a phone number on the wall. Between the two of us, we had a pleasant argument about whether she should learn to speak English or I should learn Spanish. She had been in the country doce (twelve) years and ran an unofficial daycare in her home. I told her about the free ESL classes at the library. I was curious and wanted to be helpful. We were both frustrated by our inability to communicate, as indicated by the occasional frown and, “No, no, no.” We both had questions. The more I meet aliens on my lawn, the more I admire them. They are incredibly brave, intelligent and resourceful. I think most of them are just looking for an abundance of spring grass. This entry was posted in Short Takes on Life and tagged cultural barriers, displaced citizens, hablo español, Hispanics, Spanish language, spring grass, wild animals in city, wild turkey. Bookmark the permalink. It is exciting when those aliens land but be careful if you are truly invaded. 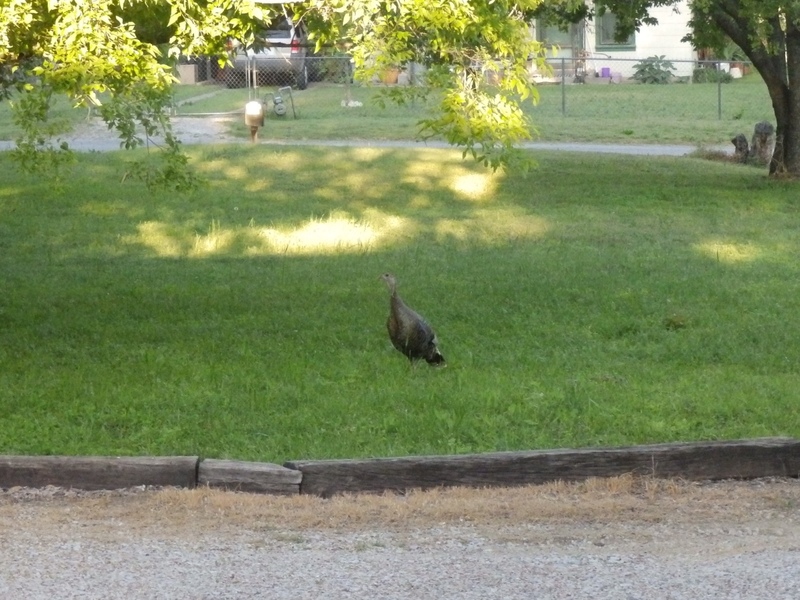 I understand wild turkeys can be very aggressive. Good photos! Thx, Carole! I know about aggressive turkeys, shot one once & won a competition w/the story. ~Annie O.